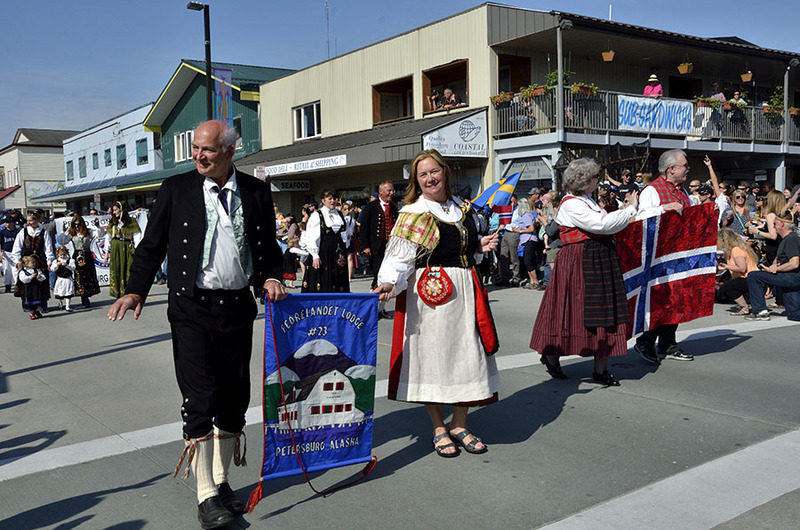 It’s hard to imagine so much Norwegian-ness packed into one weekend, but this town is really up to the task. 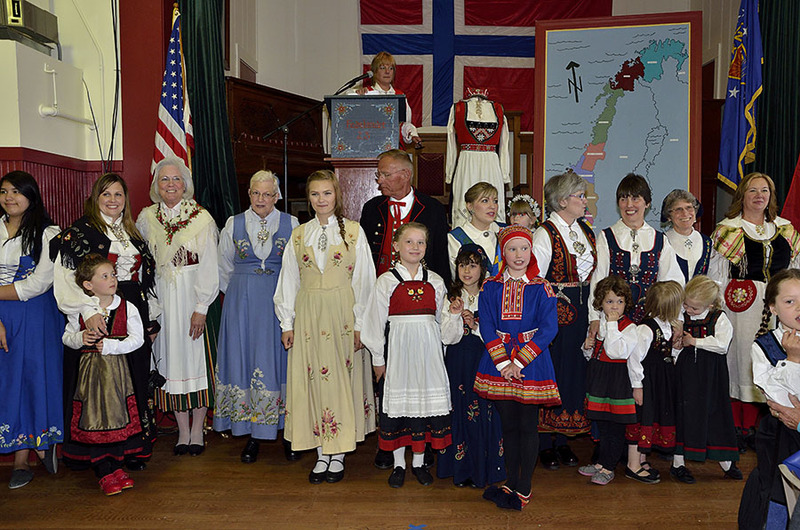 Petersburg’s Norwegian exchange student and her family keep saying how much more Norwegian we are here compared to Norway. 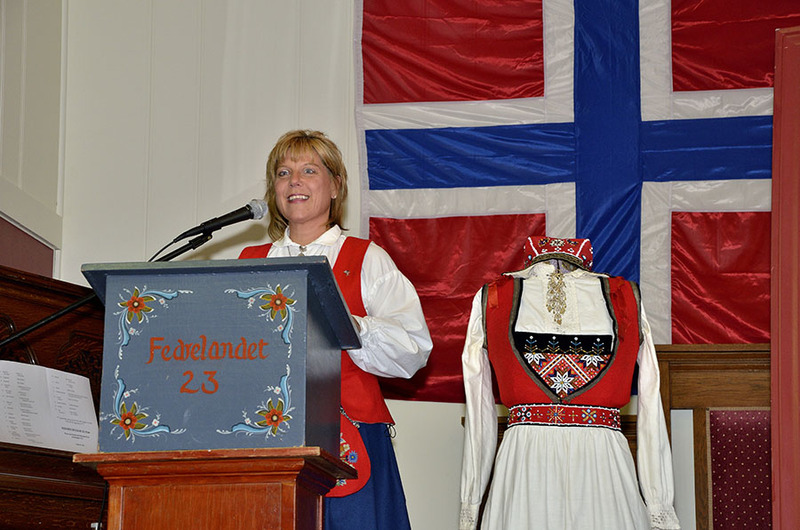 Our town is steeped in traditions while Norway has become more westernized, and the Norwegians enjoy seeing their culture and customs celebrated so much here. 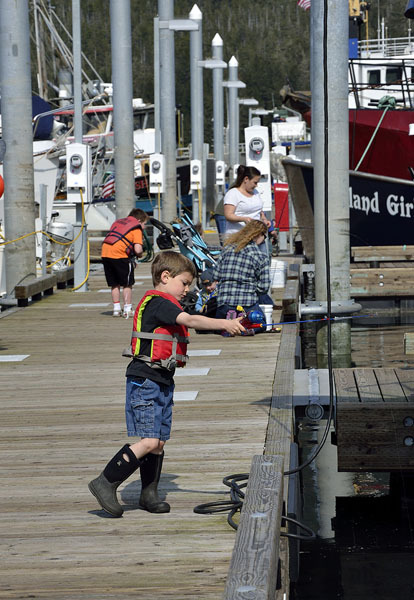 Last Saturday started with the Lil’ Fisk Derby for young anglers, and our dock was crowded with short people in life jackets hoping to win a prize despite the handicap of short attention spans. They were adorable. 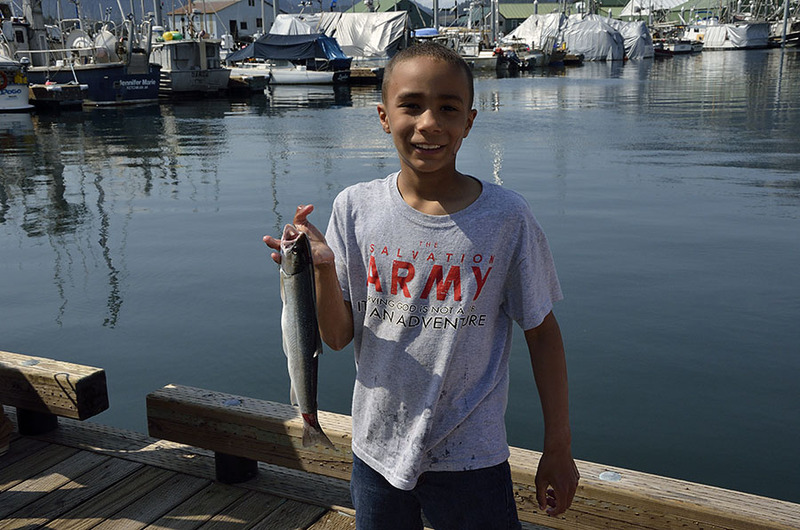 Herring and smelt were caught with bare hooks, and this fellow caught a nice little Dolly Varden trout. 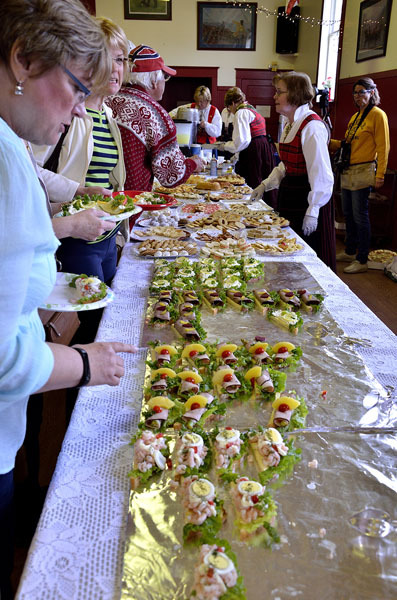 Meanwhile people were lining up to get into the Kaffe Hus at the Sons of Norway hall, where we could sample all kinds of open faced sandwiches, cookies, pastries, and cakes. The line was quite long, but we had some nice musical entertainment to distract us. 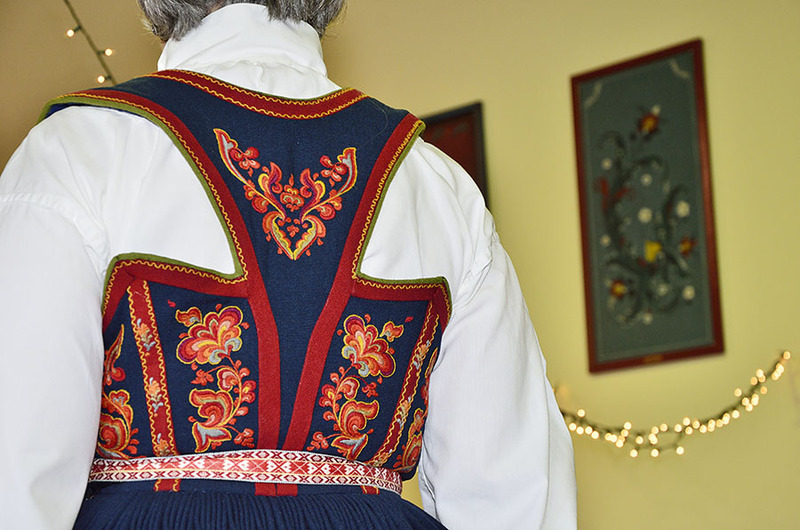 I was admiring the Norwegian sweater worn by the gal in front of us in line, and I found out that it was made by her mother – who was busy playing the accordion for us. It was hard to choose among the treats, all hand-made. 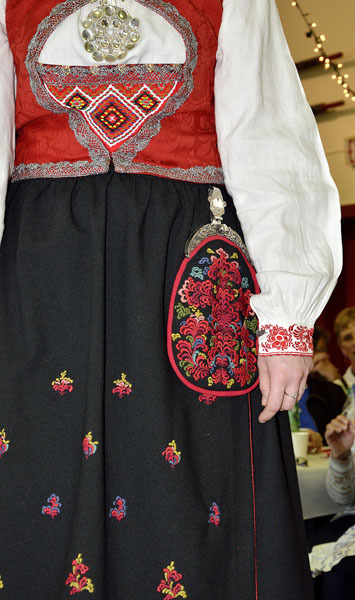 Butter features prominently in Norwegian cooking, as well as the spice cardamom. Everything was as beautiful as it was delicious! 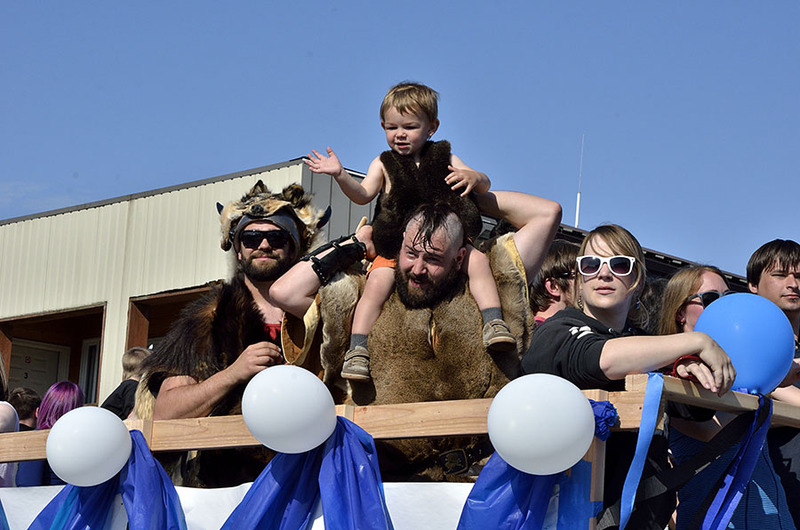 We headed back to the boat to recover for a while, then headed to the next event – the Pageant. 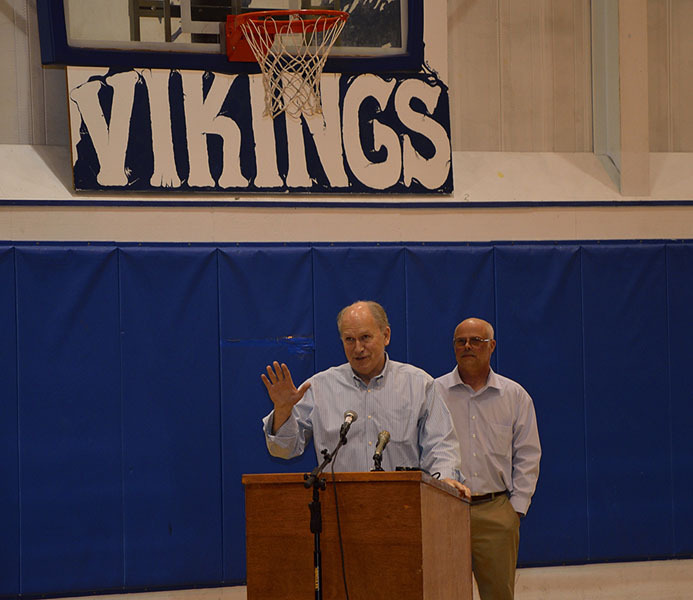 We had VIP guests in attendance – Alaska’s Governor and Lt. Governor and their spouses were in town to dedicate the new drive-down dock in the harbor. The Governor was embarrassed to admit that it was his first time in Petersburg. 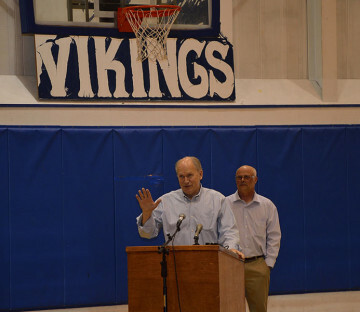 When he mentioned that he will be hosting the King of Norway next month up in Anchorage he said that he realized his mistake – Petersburg would have been a MUCH better choice. 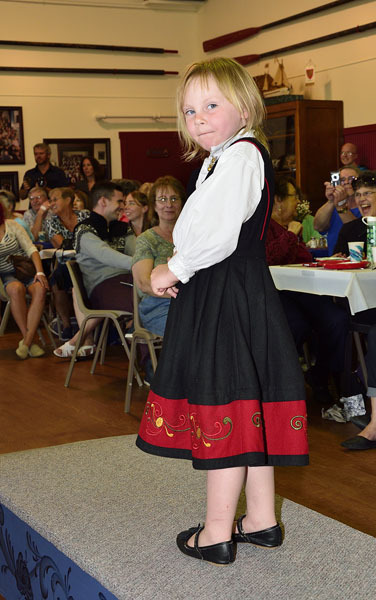 The Pageant was lovely – we had entertainment from the young Norwegian dance troupe in three groups: 1st and 2nd graders, then 3rd and 4th graders, then the 5th-8th graders. 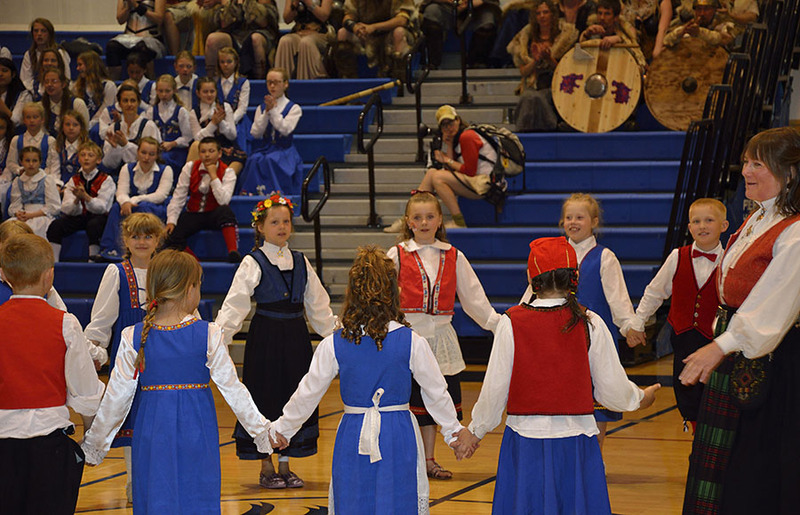 It’s so heartwarming to see so many young people in town participating in all these cultural activities – boys as well as girls. 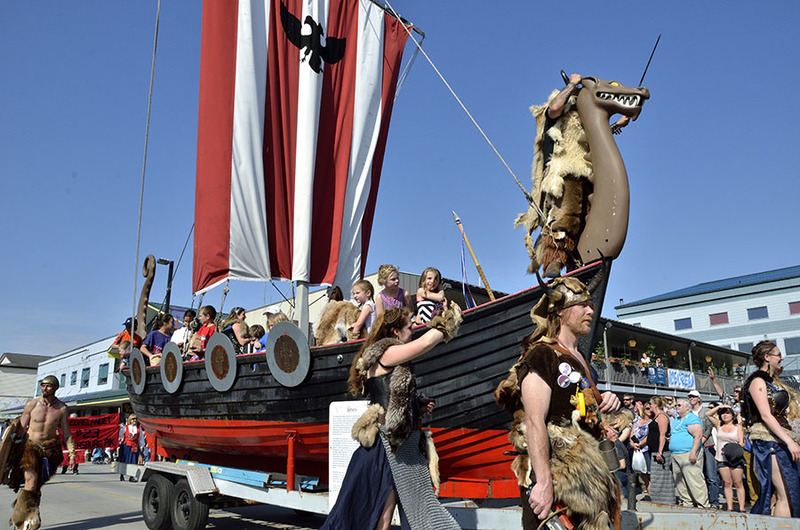 You might notice the vikings and valkyries sitting in the bleachers – they were very well behaved and didn’t try to pillage anything while the youngsters danced. A few of them even came down and participated in a dance or two. 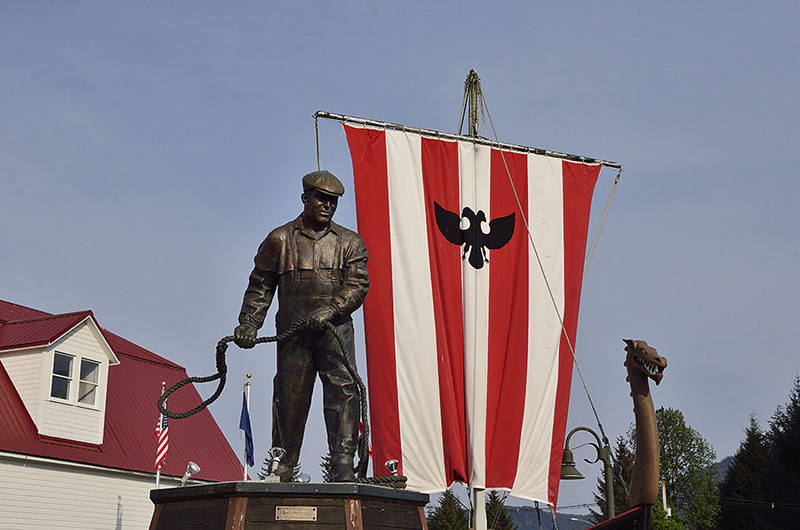 No Pageant would be complete without joining together in song – first the “I Love Humpback Salmon” song, followed by the “Alaska’s Flag” state song. As new Alaskans, it was pretty neat to sing the state song standing a few feet from the Governor, surrounded by our new friends from town. 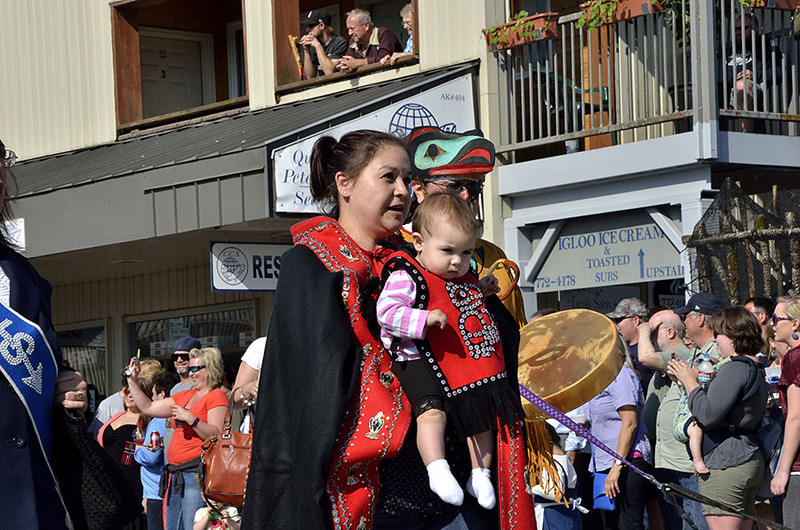 I’ll share the lyrics of the salmon song with you – feel free to sing along, loud and proud. 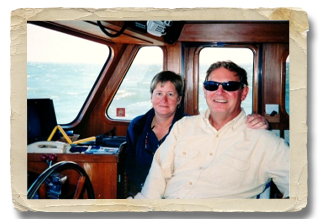 “I love humpback salmon, Good ‘ol humpback salmon, Caught by the Norske fishermen. I like shrimp and shellfish, They sure do make a swell dish, I think the halibut is grand! I don’t like T-bone steak, Cut from a steer in Texas, But give me fish! And I don’t give a damn, If I do pay taxes! I like humpback salmon, Good ‘ol humpback salmon, Caught by the Norske fishermen!” I sang the song, despite the fact that I can’t stand to eat seafood of any kind. It makes pot-luck dinners and dinner parties a little more challenging to attend here, but it’s fine. We enjoyed a concert from a jazz group brought in for the Festival, and wrapped up the weekend with a little open house for our local friends. It’s time to go cruising now, though we’ve found Petersburg to be a very sticky place – hard to leave. 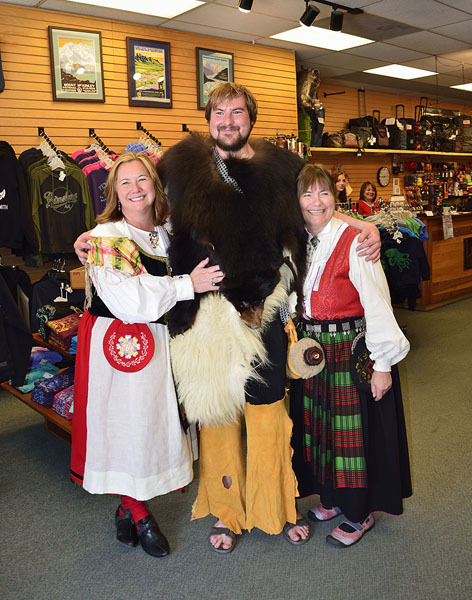 Thanks to all the vikings, valkyries, and the bunad-wearing models and dancers – it was a memorable Festival! 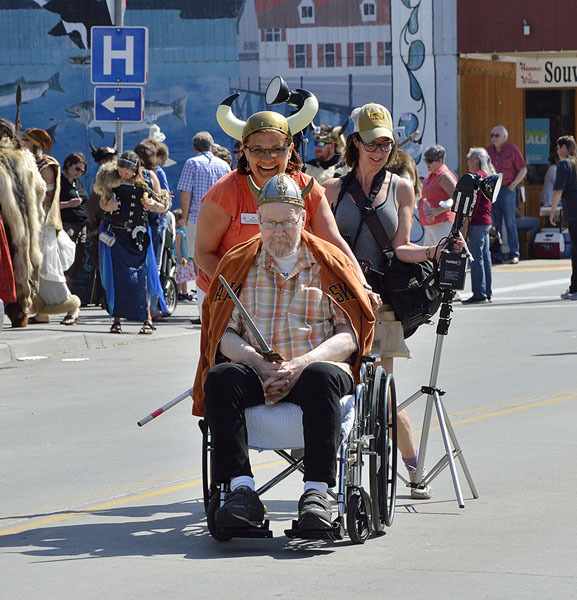 There were so many characters and interesting sights that the Little Norway Festival Parade deserves its own post. 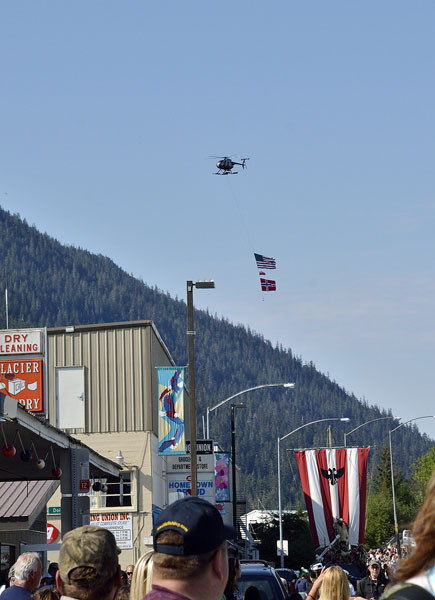 The weather was perfect for the afternoon’s event, kicked off by the Temsco helicopter flying over the Narrows with the American and Norwegian flags as the parade participants lined up. A color guard from our local Coast Guard station led the way, with fire trucks, a police car, and members of the volunteer search & rescue crew following right behind. 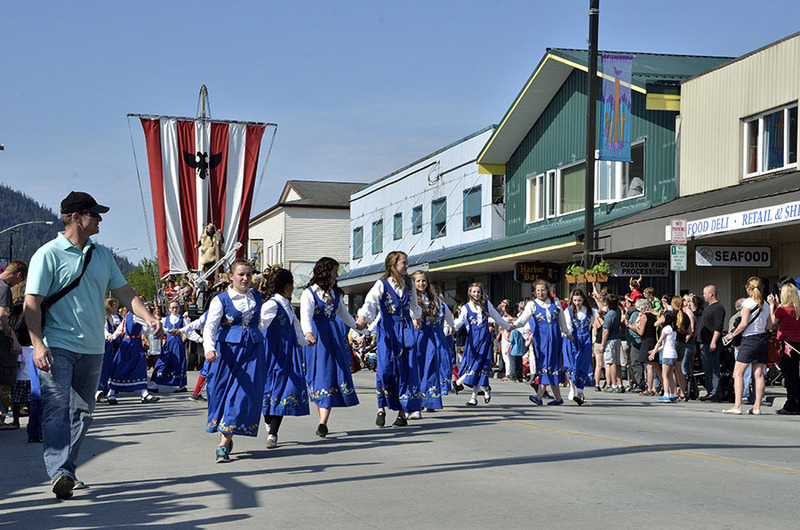 Nordic Drive was lined with people, many who live here now or had at some point – much like a Coming Home Parade in Canadian towns. There were tourists enjoying the sights as well, but our overall feeling is that the Festival is put on by the town, for the town. 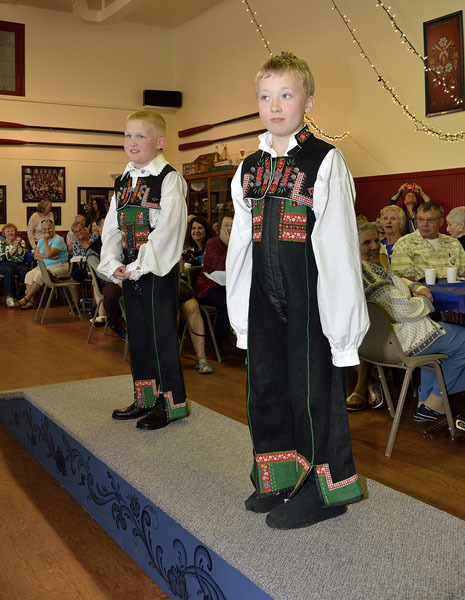 The Sons of Norway lodge members still wearing their beautiful bunader paraded along… …followed by the youngsters from the traditional dancing troupe. 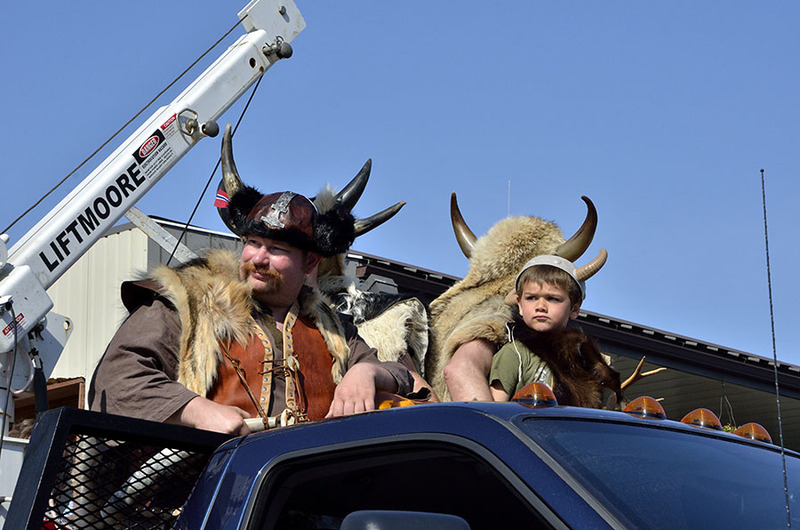 In stark contrast to the traditional costumes, the Viking ship followed, full of Vikings and Valkyries… big and small. 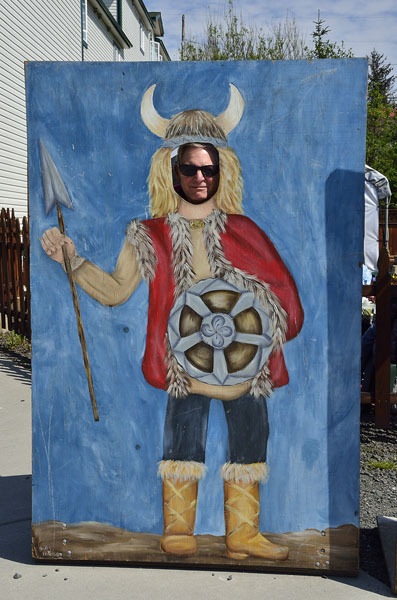 Don’t let those dimples fool you… I’ll bet that little guy can pillage with the best of them! 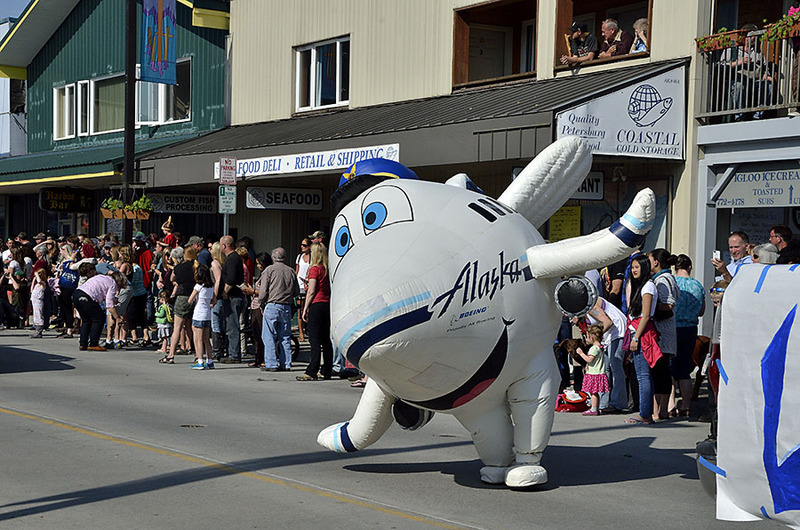 The Native Alaskans were represented by members of the ANB and ANS, resplendent in their button blankets and carved headgear… And we howled with laughter at the antics of the Alaska Airlines dancing plane – that little plane had some awesome moves! 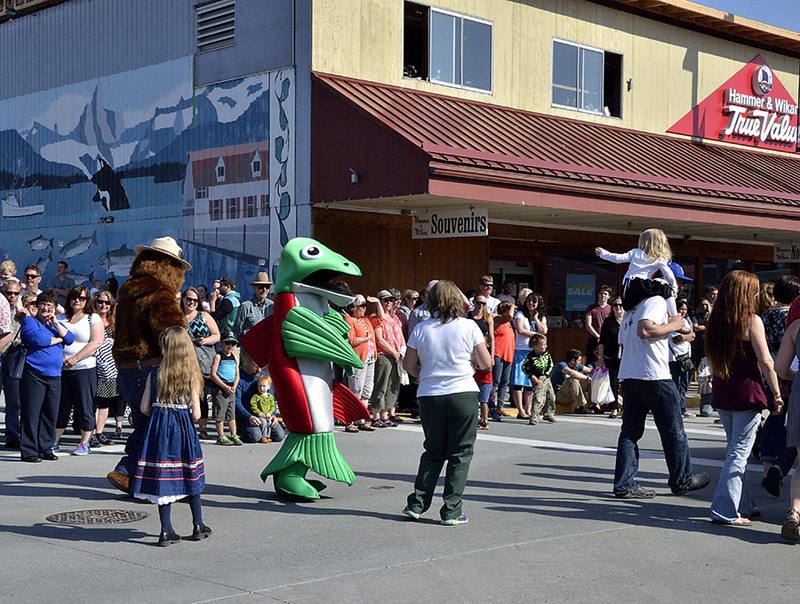 Smokey the Bear and a big sockeye salmon visited with the crowd, thanks to the US Forest Service (a big employer in town). Immediately following the parade the annual herring toss was in full swing, with fish flying far and high as the competition heated up. 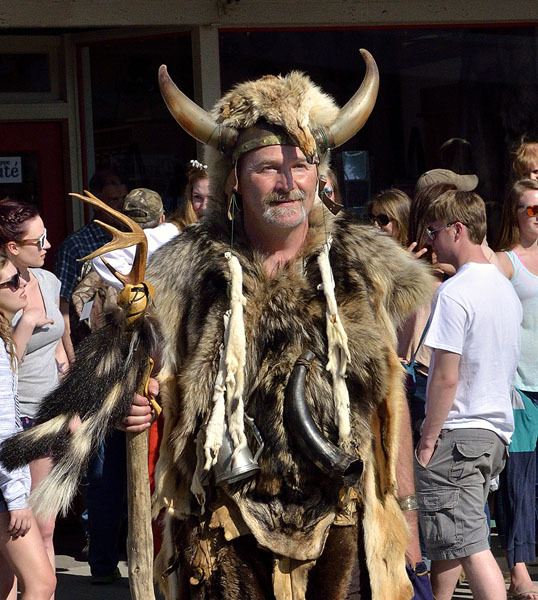 Meanwhile Jim channeled his “inner viking”… …while other vikings ran around town, wreaking havoc and dragging people off to the viking jail. 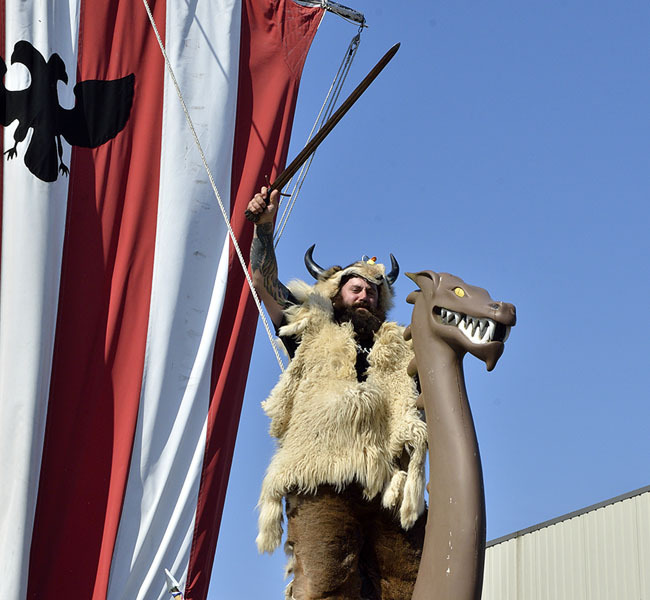 And remember – you’re never too old to celebrate your viking-ness. 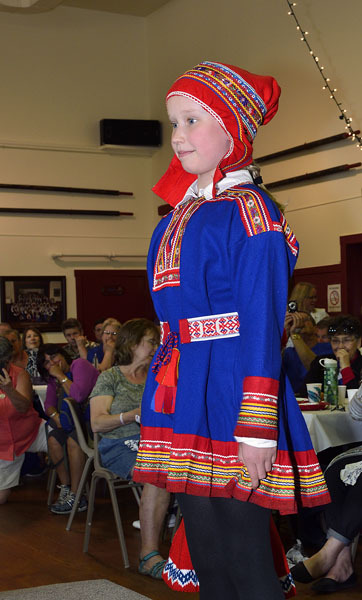 There’s still a little bit more of the Little Norway Festival to share, in the next post. 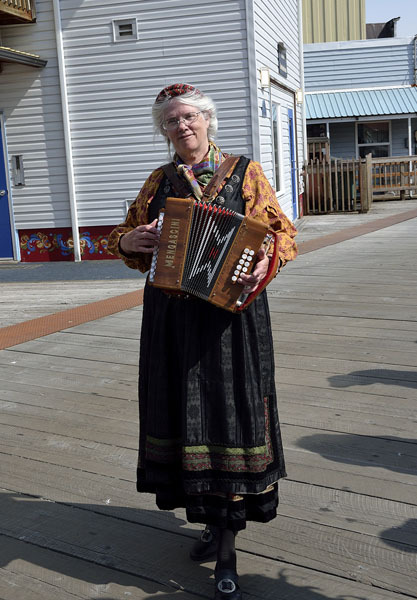 We began our Festival experience by attending “Shipwreck on Cannery Island”, an original play written and performed by the Mitkof Mummers Theater Company. 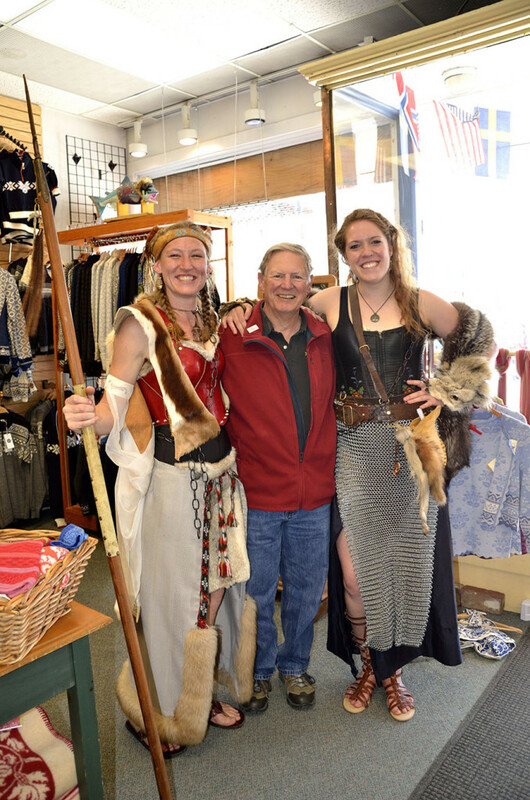 It involved Vikings and a cannery run by (who else?) Norwegians. I didn’t take any photos – I was laughing too hard – but it was just outstanding… a great way to kick things off. 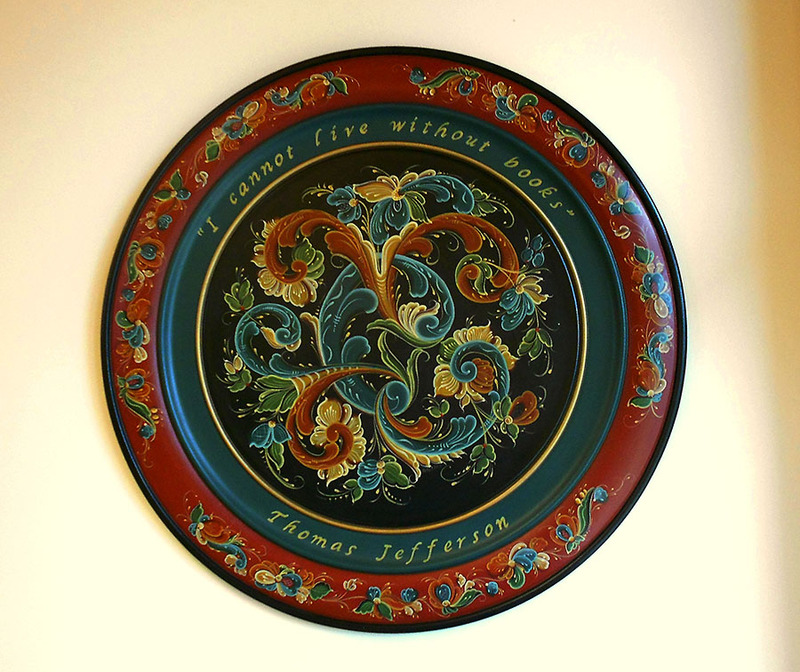 The next morning Jim and I took a little 1-hour rosemaling class – rosemaling is a type of decorative painting, primarily from Norway. 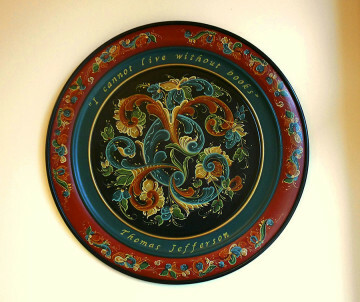 There are examples of rosemaling all around town – on the harbormaster’s office, building trim, company signs, and this beautiful wooden plate that hangs in the Library just to name a few examples. We didn’t expect to become competent rosemalers in an hour, but we thought it would be fun to give it a try. 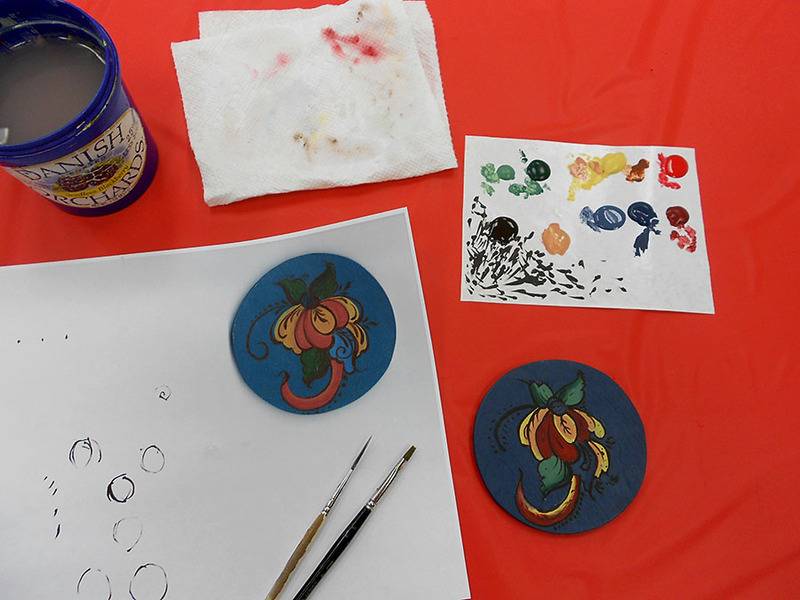 We all had a lot of fun, and we came away with a much greater appreciation for the skill and experience of real rosemalers. Regardless, our little samples are displayed proudly on the refrigerator. 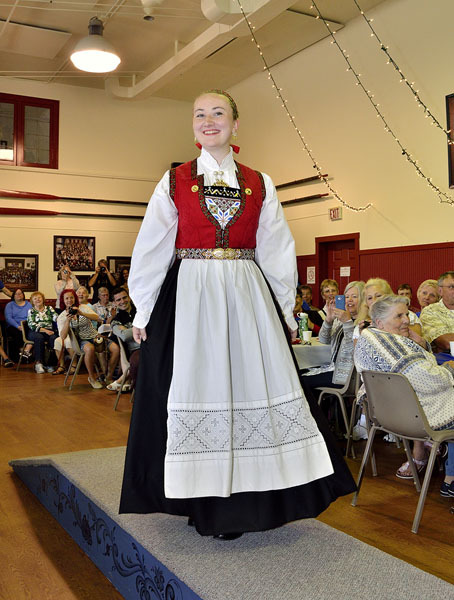 The next major event was the Scandinavian Style Show and luncheon, and we were advised to line up to buy our tickets early – which I was happy to do since I wanted a good spot to take photographs. 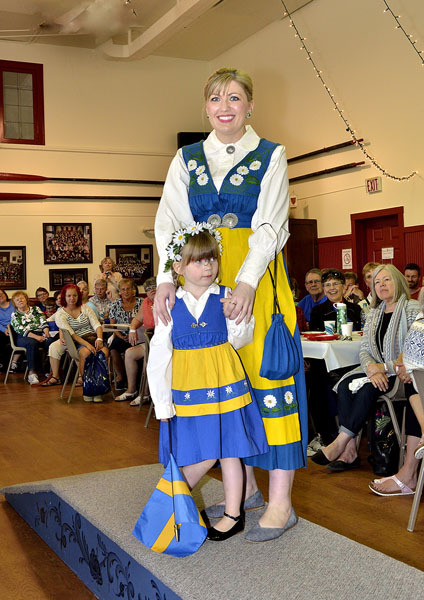 The show was narrated by our talented harbormaster Glo, and the models showed off about 75 different bunad – traditional Norwegian folk costumes, as well as costumes from Sweden and the northernmost Sami people. 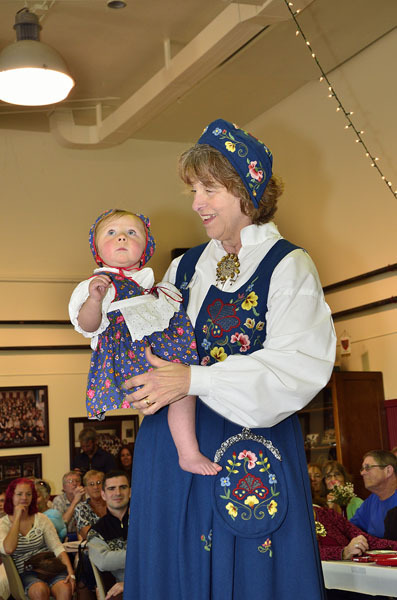 What was truly amazing was to learn how many of these stunning costumes had been made for people in town by Glo – expert seamstress, bunad historian, and gifted embroiderer. 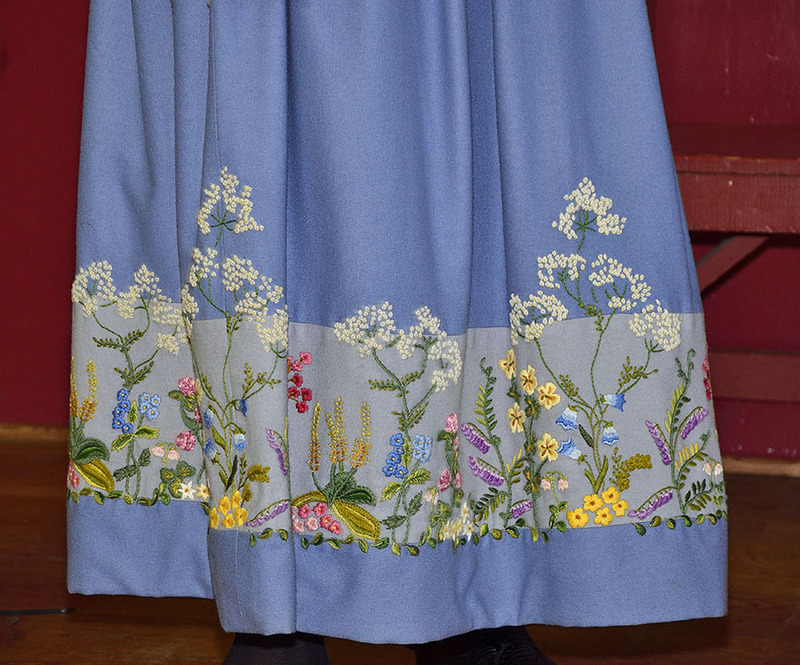 Many of the garments Glo made took 1-2 years to complete, and as I was photographing the different styles from various regions I realized how much beauty was in the detail. 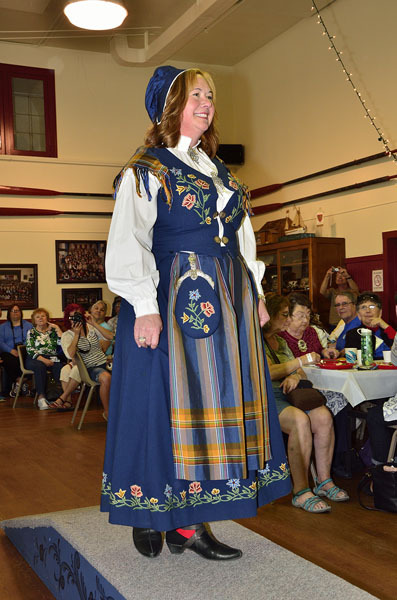 It was wonderful to see so many people involved in the show – some ladies had made their bunad from kits purchased in Norway, working together to help one another. 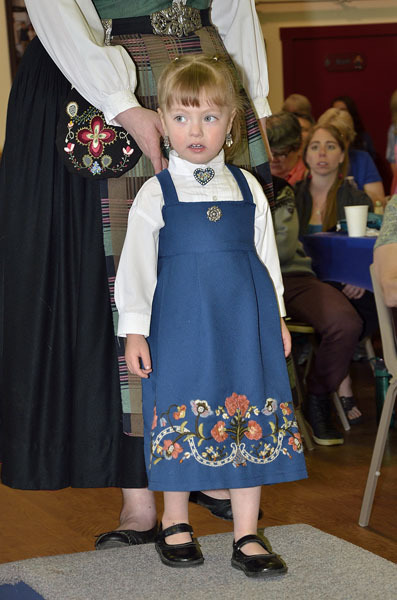 It was interesting to hear about the ways that a child’s bunad is constructed to allow for growth and modification as the child grows, and all the children (and men!) were good sports about modeling. 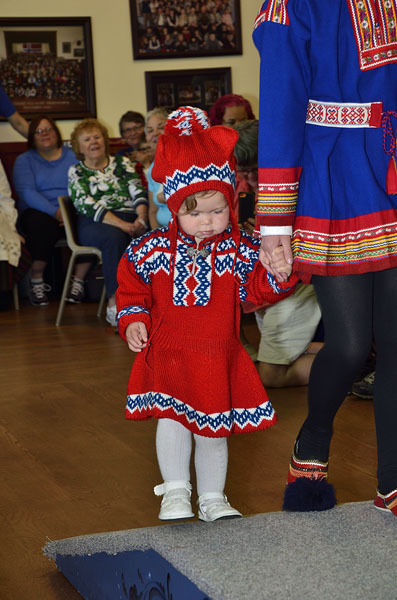 These are Swedish bunader… And this is an example of the Sami costume: This little gal in a knitted dress was my favorite. 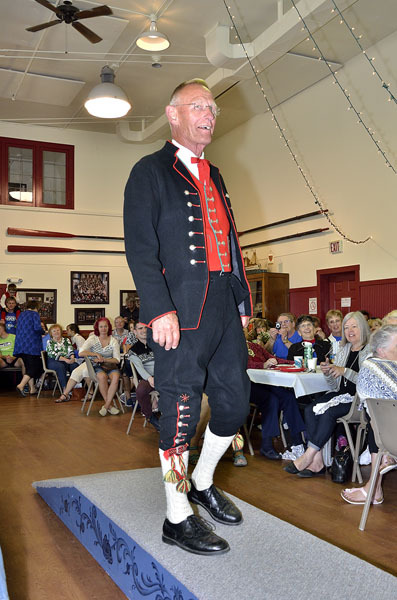 Even though it was a warm sunny day, many people were wearing their traditional Dale of Norway sweaters, and in the afterglow of the fashion show I finally got Jim to choose a Dale sweater for himself. It’s “Petersburg formal wear” – appropriate for just about any occasion, and it looks great on him. There’s lots more of the Festival to show, but that will have to wait for the next post.